Microtubules are highly-dynamic structural and functional intracellular highways. The term cytoskeleton conjures up an image of rigid, immutable, and permanent structure. In reality, the cytoskeleton is a highly dynamic interconnected network composed of three different principal components: microtubules (polymerized tubulin dimers), microfilaments (polymerized actin), and intermediate filaments. Microtubules are the largest cytoskeletal components. They play a role in nearly every cellular process. They give structural stability and form to an otherwise amorphous cell. They are the principal components in an interconnected intracellular “highway” by which all manner cellular cargo may be shuttled via a bustling network of molecular motor proteins. During mitosis, microtubule contraction, focused at one of two mitotic spindles, provides the force necessary to divide chromosomes. The ever changing nature of the cellular microenvironment necessitates adaptability, particularly during development. Microtubules and other cytoskeletal components facilitate this adaptability by virtue of their polymeric structure. The fundamental unit of the microtubule is a tubulin dimer, composed of one alpha tubulin-subunit, and one corresponding beta-tubulin subunit. These dimers polymerize to form a hollow, tubular structure approximately 24nm wide. The natural state of unmodified tubulin is one of constant flux, with a nearly equal rate of polymerization and depolymerization. 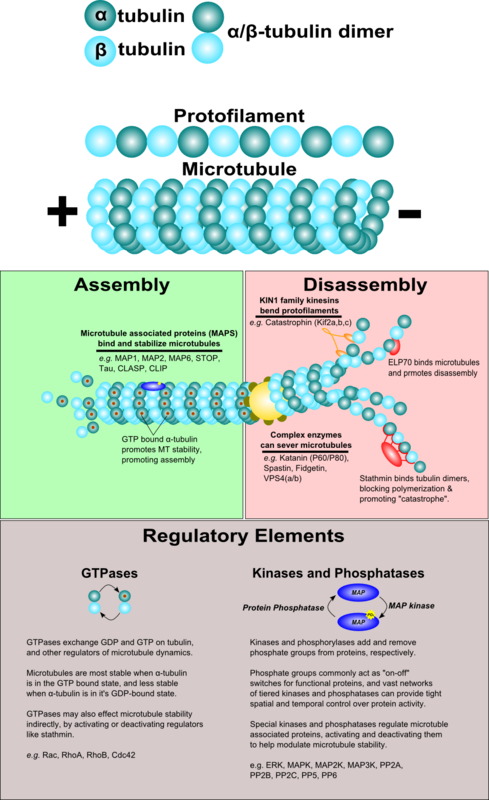 Several common GTPase families like Rac and Rho promote microtubule assembly indirectly by facilitating GDP/GTP exchange on regulatory members that effect assembly and disassembly of tubulin dimers. Other microtubule stabilizers take a more direct approach. Microtubule associated proteins like MAP1, MAP2, MAP4, or MAPtau bind polymerized microtubules stabilize the polymerized form, promoting assembly and microtubule growth. Most MAPs are activated by phosphorylation, and MAPK (map kinase) phosphorylation cascades add an additional layer of control to the process of microtubule assembly. Conversely, cells have several different ways to regulate microtubule disassembly. 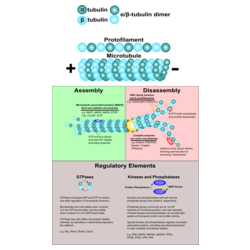 Direct methods for promoting disassembly include components like Stathmin, which binds alpha/beta-tubulin dimers and prevents them from polymerizing. Microtubule severing enzymes like Katanin are able to break microtubules in the middle of their structure, while Kinesin I family members like KIF2 walk along microtubules and promote “fraying” and depolymerization.